Last night when sorting through more of my collection, the metalflake purple paint of the Hot Wheels FORMUL8R caught my eye. I’ve got so many cars set aside to feature here, it is difficult at time to find the ‘right car’. For some reason last night, I felt like this is the one that should be posted. After pulling the FORMUL8R from the blister and really looking at it, I find that it’s really kind of an interesting car. 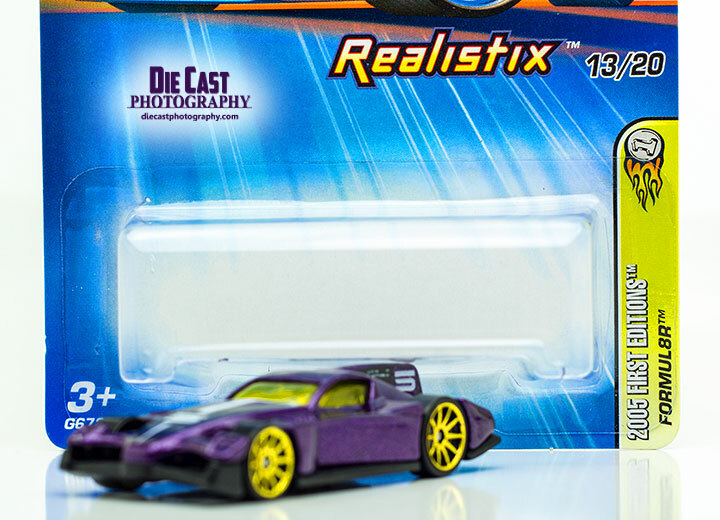 The Hot Wheels FORMUL8R was initially released in 2005 as part of the First Editions – Realistix series. The version show here wears 10SP wheels. There was another version available in 2005. That version wore FTE (Faster Than Ever) wheels. I myself am not a fan of the 10SPs on this casting. Maybe if they were a different color? I don’t know.